After seeing reading the independent lab tests on Amsoil vs. all of the competitor's oils and seeing how Amsoil is the least expensive oil tested, we cannot understand how anyone would continue to keep buying the competitor's oils once learning of this information. Plus the fact that Amsoil has a limited warranty covering the repair costs of your vehicle. Does your oil have that? The following 10 synthetic motor oils were selected. All oils were 5W-30 and are recommended for the American Petroleum Institute (API) SN and International Lubricants Standardization and Approval Committee (ILSAC) GF-5 performance specifications. According to the ASTM, the Four-Ball Wear Test "can be used to determine the relative wear preventive properties of lubricating fluids in sliding contact under the prescribed test conditions. No attempt has been made to correlate this test with balls in rolling contact. The user of this test method should determine to his own satisfaction whether results of this test procedure correlate with field performance or other bench test machines." The smaller the wear scar, the better the performance in the test. Total Base Number (TBN) is the measure of a lubricant's reserve alkalinity, which aids in the control of acids formed during the combustion process. TBN can also be used as a measure of lubricant degradation in service. Motor oils that have a high TBN and demonstrate good TBN retention are known to effectively reduce the corrosive effects of acids over an extended period. Performed by independent, third-party lab February 2013. The higher the number, the better the performance in the test. The Cold Crank Simulator Test determines the apparent viscosity of lubricants at low temperatures and high shear rates. Viscosity of lubricants under these conditions is directly related to low-temperature engine cranking.1 The test was performed at -30°C (-22°F). Results are reported in centipoise (cP), with lower values reflecting easier cold starts and reduced battery strain. To meet the API SN and ILSAC GF-5 motor oil specifications, a motor oil's cold crank viscosity must not exceed 6,600 cP. The lower the value, the better the performance in the test. Motor oils can form deposits when exposed to increased heat, reducing efficiency and contributing to poor overall performance. According to the ASTM, the TEOST test method "is designed to predict the high temperature deposit forming tendencies of an engine oil. This test method can be used to screen oil samples or as a quality assurance tool." Given the number of vehicles now equipped with direct fuel injection, turbochargers and other performance-enhancing technologies that increase heat, deposit control has taken on increased importance. To meet the API SN Resource Conserving and ILSAC GF-5 motor oil specifications, a 5W-30 motor oil must limit total deposit formation to 30 mg or less. *Results for Red Line High Performance ranged from 29.1 mg to 31.4 mg. The average of the three tests run is shown in the graph. The NOACK Volatility Test determines the evaporation loss of lubricants in high-temperature service. According to the ASTM, "Evaporation may contribute to oil consumption in an engine and can lead to a change in the properties of an oil."" As with the TEOST test, low values in the NOACK Volatility Test are of particular benefit in modern, hot-running engines. In the NOACK test, a candidate oil is exposed to heat and circulating air. Following 60 minutes, the remaining oil volume is weighed and compared to the original weight, with the difference reported as the percentage of weight lost. Results must be limited to 15 percent or less to meet the API SN and ILSAC GF-5 specifications. While all oils were below the API SN and ILSAC GF-5 upper limit, results indicate differences in high temperature volatility. Half of the oils limited the percentage weight lost from volatility to under 10 percent, with AMSOIL Signature Series Synthetic Motor Oil having the third-best result. Although AMSOIL Signature Series Synthetic Motor Oil is recommended for 25,000 miles/one year in normal service1, light-duty vehicles accumulate an average of 11,318 miles a year2 and are generally used in driving conditions that fall under the severe service3 category. For those reasons, overall annual cost is evaluated at 11,318 miles under severe service driving conditions. Signature Series Synthetic Motor Oil carries a drain interval of up to 15,000 miles/one year, whichever comes first, in severe service. Because the other nine oils do not carry a recommended drain interval, a drain interval of 4,777 miles was used, which represents the average drain interval of motorists as reported in the 2012 National Oil & Lube News Operator's Survey. Although Mobil 1 Extended Performance is recommended for 15,000 miles in out-of-warranty vehicles in certain driving conditions, its extended drain recommendation does not apply for this evaluation. According to the official statement on the Mobil 1 Extended Performance label, "Extended service is not recommended in severe service applications involving racing and commercial use, frequent towing or hauling, extremely dusty or dirty conditions, or excessive idling." 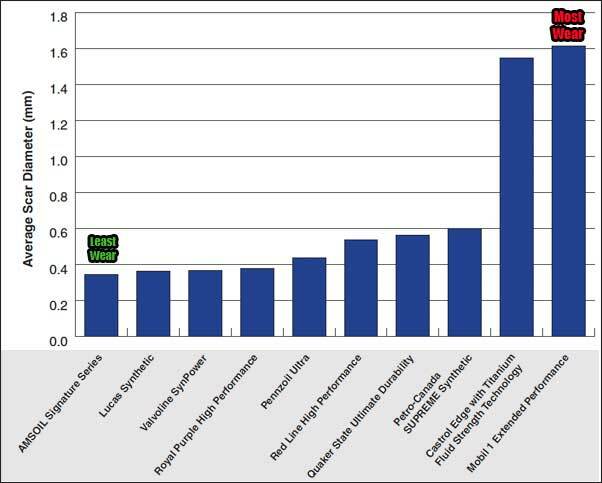 Per-quart prices (Table 2) reflect the MSRP where available or average of a cross-section of retail outlets surveyed January 2013. Costs are based on a five-quart capacity. Overall value represents the cost of the oil only. 1 AMSOIL defines normal service as personal vehicles frequently traveling greater than 10 miles at a time and not operating under severe service. 2 "Average Vehicle Distance Traveled in Miles and Related Data - 2011 (1) By Highway Category and Vehicle Type". See: http://www.fhwa.dot.gov/policyinformation/statistics/2011/pdf/vm1.pdf. 3 AMSOIL defines gasoline engine severe service as turbo/supercharged engines; commercial or fleet vehicles; excessive idling; daily short-trip driving less than 10 miles (16km); frequent towing, plowing or hauling; dusty-driving conditions; or in vehicles with 100,000 or more miles that will be using AMSOIL engine oil for the first time. Five-quart capacity. Cost of oil only. Based on MSRP where available or a cross-section of retail outlets surveyed January 2013. AMSOIL INC. has been the leader in synthetic motor oil formulation since its introduction of the world's first API rated synthetic motor oil in 1972. By specializing exclusively in synthetic lubricant technology, AMSOIL is able to optimize the most advanced chemistries available. The "Genuine Synthetic PAO Formulated" designation displayed on AMSOIL packaging indicates that the oils are formulated with Polyalphaolefin (PAO) synthetic base stocks. This chemistry is the industry's premier base stock technology. Unlike conventional mineral-based chemistries, AMSOIL PAO base stocks contain fully saturated, hydrogenated molecules and are free of wax and other impurities. Combined with an exact balance of premium additives, it delivers superior hot and cold temperature performance, resists oxidation and acid formation and provides long-term wear protection. AMSOIL "Genuine Synthetic PAO Formulated" oils have shattered the parameters of the most rigorous industry testing and set the standard for all other motor oils. Since 1972, AMSOIL Synthetics have proven to be the BEST. AMSOIL also engineers and manufactures Super Duty Oil filters which have a 12,500 mile service life as well as specialized filtration systems for commercial and fleet applications in cars and light, medium and heavy trucks which can filter particles down to less than one micron (a standard full flow oil filter can only filter to 20-25 microns with any degree of efficiency) making oil changes virtually unnecessary and virtually eliminating engine wear. These filters have been proven by millions of miles of over-the road trucks, construction equipment and fleet service. AMSOIL saves you time and money. The only 25,000 mile/one- year and 35,000/one- year motor oil in the world. Provides up to two-times the wear protection of other motor oils. Increases the life of your vehicle. Improves performance, fuel economy and efficiency. Diesel oil and filtration products designed to deliver 1,000,000 miles for over-the-road trucks before engine overhaul. Used by many national racing teams, fleets, police departments, construction firms and trucking companies. High Performance Synthetics is comprised of a group of highly skilled team of Engineers and Lubrication and Filtration Specialists. You too, can join our group when you become an AMSOIL Dealer and take advantage of all that we offer as you use products in your own vehicles or begin your own AMSOIL business. You won't find a more knowledgeable and skilled group of Dealers anywhere which is very important when you need support as you build your business. In addition, as a Dealer in our group you will receive exclusive unlimited product, technical and business support from the only group of Truck and Automotive Engineers and Lubrication Specialists on the net. We do not only run our business on the internet. We also have numerous commercial, industrial, trucking, excavating, construction, logging, police, racing and many more accounts that we support and service on a regular basis. We have several fully stocked warehouses and fully equipped shop facilities. This provides us with excellent knowledge of the products, equipment and the business and the ability to respond immediately to any of your needs. We will use this knowledge and experience to help you get started so you too can achieve your goals. 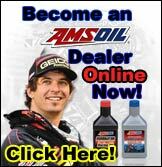 We offer several options to receive information on AMSOIL. We welcome the opportunity to work with your personally as your servicing AMSOIL Dealer. Our AMSOIL Dealer Group is led by a Truck/Automotive Engineer and Lubrication Specialist with over 18 years experience. This exceptional benefit is unavailable elsewhere. Please, contact us (CLICK HERE for contact info) and we will send you an exclusive comprehensive package of product, technical and business information. If you are serious about AMSOIL products and the business opportunity this is the best option. You will receive extensive technical and business support from both myself and my Direct Jobber, a Detroit, Michigan Truck/Automotive Engineer and Lubrication Specialist with over 19 years experience. We look forward to helping you learn about AMSOIL. Or for a smaller, very general information package (which includes a catalog and Dealer application) you can request information via any of the links below.